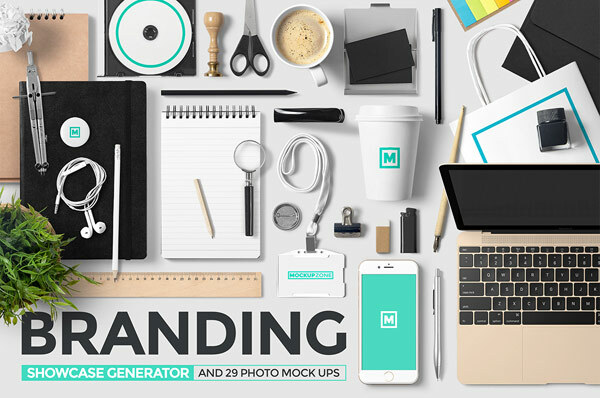 Branding showcase generator with lots of stationery and office items plus 29 photo mock ups. There it is, the new branding showcase generator from Mockup Zone! It’s a very comprehensive corporate and branding mock up, which makes it a breeze to create stunning presentations for your clients or your own portfolio. 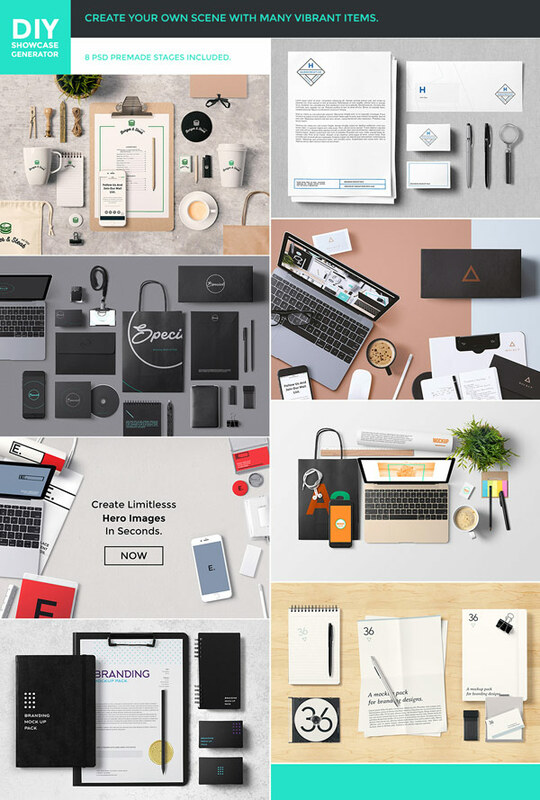 Mockup Zone’s branding showcase generator is equipped with lots of stationery and office items as well as 29 well composed branding mock up photos. You can use all the individual elements or or pick one of the premade PSD stages to create professional showcases with ease. When you download the branding showcase generator from Mockup Zone, you will get separated Adobe Photoshop files (PSD), which include fully editable mock up elements and environmental items. You can move, rotate or scale the items as you want. Furthermore, you can choose from 20 high quality background textures to give your showcases a more natural look and feel. In addition to the many individual items, which are fully separated and layered, you will also get 8 ready made PSD stages as well as 29 photo mock ups. You can download this branding showcase generator for low budget here. Branding showcase generator with 29 photo mock ups. Create your own scenes with many vibrant items or use the premade PSD stages. Lots of branding, office, and stationery items photographed in great quality. The 29 photo mockups with editable backgrounds, light setups, and included textures. This download pack is available for purchase on Creative Market.